Instant downloads of all 946 LitChart PDFs (including Thinking, Fast and Slow). Welcome to the LitCharts study guide on Daniel Kahneman's Thinking, Fast and Slow. Created by the original team behind SparkNotes, LitCharts are the world's best literature guides. A concise biography of Daniel Kahneman plus historical and literary context for Thinking, Fast and Slow. A quick-reference summary: Thinking, Fast and Slow on a single page. In-depth summary and analysis of every Chapter of Thinking, Fast and Slow. Visual theme-tracking, too. Explanations, analysis, and visualizations of Thinking, Fast and Slow's themes. Thinking, Fast and Slow's important quotes, sortable by theme, character, or Chapter. Description, analysis, and timelines for Thinking, Fast and Slow's characters. Description, analysis, and timelines for Thinking, Fast and Slow's terms. Explanations of Thinking, Fast and Slow's symbols, and tracking of where they appear. An interactive data visualization of Thinking, Fast and Slow's plot and themes. Kahneman was born in Tel Aviv in 1934 and spent his childhood years in Paris, France. He and his family lived in Paris when it was occupied by Nazi Germany in 1940, and they spent most of the war attempting to avoid internment. With the exception of his father, who died due to diabetes in 1944, his family survived. The family then moved to British Palestine in 1948, just before the creation of the state of Israel. Kahneman attended the Hebrew University of Jerusalem in 1954 for psychology and then served in the psychology department of the Israeli Defense forces. In 1958, he traveled to the United States to earn his PhD in Psychology from the University of California, Berkeley. Kahneman then became a lecturer in psychology and collaborated with Amos Tversky to study judgment, decision-making, and prospect theory. Kahneman was ultimately awarded the Nobel Prize in Economics in 2002 for his work on prospect theory. 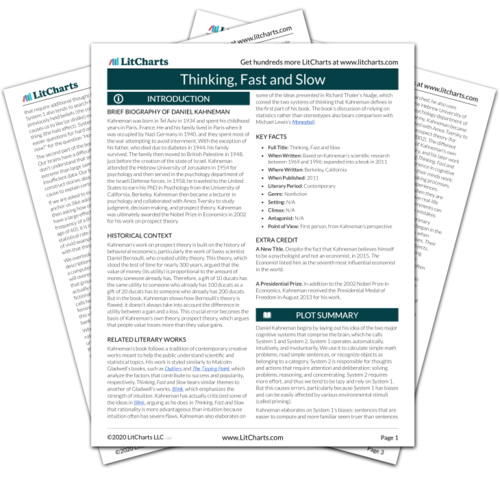 Get the entire Thinking, Fast and Slow LitChart as a printable PDF. Kahneman’s work on prospect theory is built on the history of behavioral economics, particularly the work of Swiss scientist Daniel Bernoulli, who created utility theory. This theory, which stood the test of time for nearly 300 years, argued that the value of money (its utility) is proportional to the amount of money someone already has. Therefore, a gift of 10 ducats has the same utility to someone who already has 100 ducats as a gift of 20 ducats has to someone who already has 200 ducats. But in the book, Kahneman shows how Bernoulli’s theory is flawed: it doesn’t always take into account the difference in utility between a gain and a loss. This crucial error becomes the basis of Kahneman’s own theory, prospect theory, which argues that people value losses more than they value gains. Kahneman’s book follows a tradition of contemporary creative works meant to help the public understand scientific and statistical topics. His work is styled similarly to Malcolm Gladwell’s books, such as Outliers and The Tipping Point, which analyze the factors that contribute to success and popularity, respectively. Thinking, Fast and Slow bears similar themes to another of Gladwell’s works, Blink, which emphasizes the strength of intuition. Kahneman has actually criticized some of the ideas in Blink, arguing as he does in Thinking, Fast and Slow that rationality is more advantageous than intuition because intuition often has severe flaws. Kahneman also elaborates on some of the ideas presented in Richard Thaler’s Nudge, which coined the two systems of thinking that Kahneman defines in the first part of his book. The book’s discussion of relying on statistics rather than stereotypes also bears comparison with Michael Lewis’s Moneyball. A New Title. Despite the fact that Kahneman believes himself to be a psychologist and not an economist, in 2015, The Economist listed him as the seventh most influential economist in the world. A Presidential Prize. In addition to the 2002 Nobel Prize in Economics, Kahneman received the Presidential Medal of Freedom in August 2013 for his work. Emanuel, Lizzy. "Thinking, Fast and Slow." LitCharts. LitCharts LLC, 26 Nov 2018. Web. 11 Dec 2018. Emanuel, Lizzy. "Thinking, Fast and Slow." LitCharts LLC, November 26, 2018. Retrieved December 11, 2018. https://www.litcharts.com/lit/thinking-fast-and-slow.